Charlotte Arter at this summer's British Championships in Birmingham. Pic: Owen Morgan. Charlotte Arter has enjoyed a breakthrough year in 2018, but is determined to scale more athletics peaks in 2019 and beyond. As she tells Owen Morgan, it means some big changes ahead. Cardiff athlete Charlotte Arter has decided to take the plunge and put all her efforts into becoming a full-time athlete. As she prepared to compete for Great Britain in this weekend’s SPAR European Cross Country Championships, Arter revealed she is to take a career break from her post as a performance sport officer at Cardiff University. The move comes after the British 10,000m champion was named on Welsh Athletics’ 2020 Commonwealth Games Programme and on a new British Athletics and London Marathon funding initiative within the space of a few days. All this came in the run up to her outstanding win in the senior women’s race at the British Cross Challenge in Liverpool, which doubled as the trial for the European Cross Country Championships in Tilburg. An excited Arter told Dai Sport: “It’s been a whirlwind couple of weeks. I’m hugely grateful for the support from Welsh Athletics and everything everyone’s done to help me get back from injury and having the faith in me for the funding, looking towards 2022. “I’m hugely grateful for that support from Welsh Athletics and then, of course, from British Athletics and the endurance initiative from the London Marathon. All the support is going to help me transition to the next level. Charlotte Arter chases the field after falling in the 5000m at the 2018 British Championships. She recovered to finish fourth. Pic: Owen Morgan. “I’ve actually decided to take a career break. Cardiff University have been really supportive in that they’ve allowed me to take it and I’ll actually be finishing this side of Christmas. “So, from the New Year I’ll be a full time athlete. I decided I didn’t want to look back in 10 years’ time and not know that I gave it my all. “With the support from Welsh Athletics and British Athletics I just wanted to give it my all over the next few years. “Exciting” is the perfect word to describe Arter’s athletics career at the moment, following her funding news, the win in Liverpool and her resulting selection for this Saturday’s championships. The 27-year-old has been named in the podium potential group under Welsh Athletics’ Commonwealth Games Support programme, which means she will be entitled to various benefits including medical and coaching support, warm weather training grants, and an athlete support grant. Arter was also named as one of 32 endurance athletes who will receive financial support through a new funding initiative between London Marathon Events Ltd and British Athletics. Charlotte Arter on her way to winning a 5000m bronze medal at the 2017 British Athletics Championships. Pic: Owen Morgan. Meanwhile, her win in Liverpool and subsequent inclusion in the 40-strong Great Britain team heading to Tilburg goes some way to making up for the disappointment of having to pull out of the European Athletics Championships last August. 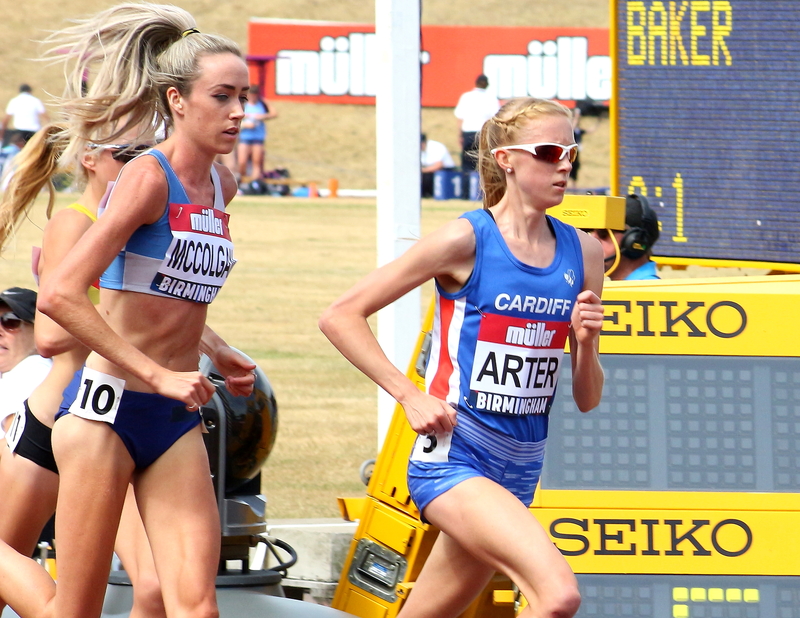 Arter had qualified for the Berlin championships by running a big 10,000m personal best of 32:15.71 at the Night of the 10,000 PBs at Highgate in May, where she claimed the British title and European Cup bronze medal. Now, the University of New Mexico alumni has another chance to take on Europe’s best, this time over a cross country course, thanks to her outstanding performance at Sefton Park. “It was a fantastic result in Liverpool,” said Arter. “It was a really competitive race and great to be part of. “There was a group of six of us and it could have been anyone’s title really, so to get the win, I was absolutely delighted. “The aim was to go out there and try to qualify, so to get the win was absolutely great. “I had to withdraw from the European track championships in the summer due to an ankle injury so I had August completely off, September was spent re-habbing, doing strength stuff and on the bike, so I only really got back into full training in October. Charlotte After celebrates her victory in Liverpool. Pic: Mark Shearman. “But my race in Burgos (Spain) two weeks before Liverpool showed I’d got back into good shape, so I felt confident going into the trials. It was just a matter of executing on the day of the race, really. So my aim was to get into the top four and qualify for the Europeans. Having qualified for the championships, Arter says she is looking forward to running in Tilburg without any pressure. The Cardiff AAC athlete said: “Liverpool is always the nerve-wracking one, that’s where you’ve got to qualify. “But for the Europeans themselves there is no pressure now, it’s just to go out and run with confidence and try and do the best I can individually and hopefully with the GB team as well. “I’m really looking forward to racing, trying to be up there with the main group, see what I can do and enjoy the experience. “Cross country’s so unpredictable, you just don’t know if someone’s going to go hard from the word go, or how it’s going to be run, so I guess you’ve just got to be ready for any situation. “I imagine the weather will be pretty similar to what we’ve had here so it could be quite wet underfoot, but until we get there we don’t really know what the course is like. “They always try to make it tough by adding logs and various snarls and things in the European races, so it will certainly be a good race I’m sure. Beyond the cross country season, Arter is hoping to reproduce the excellent form she achieved on the track last summer in order to qualify for future major championships. “The World Championships on the track next year is the main aim really, to get the qualifying time for the 10,000m,” she said. “Then, looking forward, you’ve got to set your goals high, so the Olympics in Tokyo and the Birmingham Commonwealth Games in 2022. “You’ve just got to take each month and each year as it comes, but, ultimately, those are my aims for the next couple of years. “Hopefully, having the time to live life as a full-time athlete – more recovery, time to go and train at altitude camps – all that will help me reach those goals. “It was absolutely gutting to have to withdraw from the track European Championships. I really didn’t know in October, September time whether I would be in any kind of shape to be contending for the European Cross Country. To get my spot on the team and to be going to the Europeans is the best way to be finishing 2018. “If I can just build on that going into 2019, keep the consistency going and see what we can do. I’m just trying to enjoy it all and enjoy the experiences.